Giraffe Manor is a dream location. 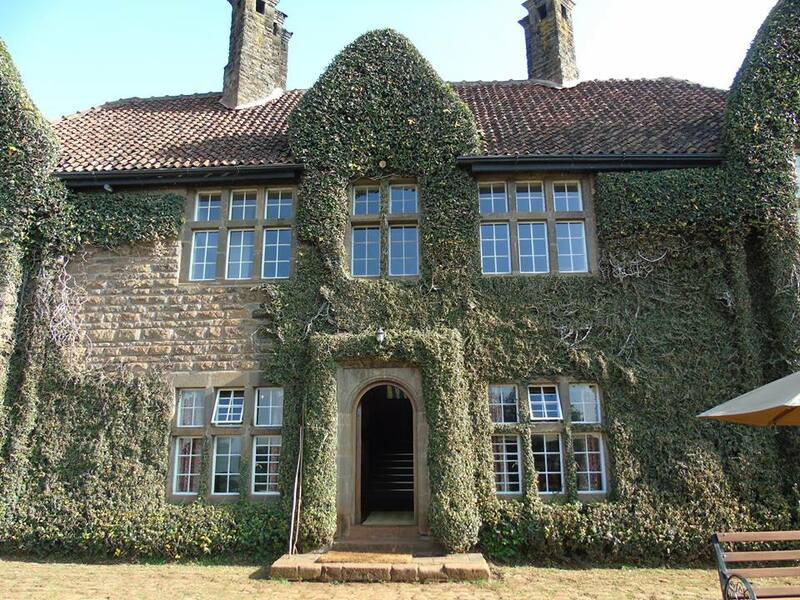 The luxurious 1930's manor house is a short drive outside of Nairobi in the Langata suburb. Surrounded by 140 acres of woodland and with 12 acres of privately owned land, the Manor comprises of 12 individual, beautifully designed rooms and shared access to relaxing lounges and terraces. 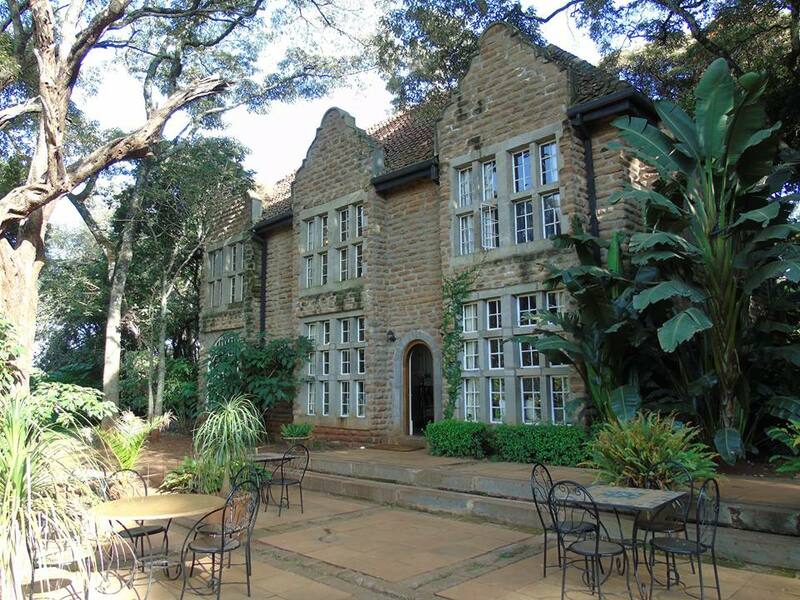 Of course, the likeilhood is that you are not considering Giraffe Manor for the superb accommodation and incredible staff. 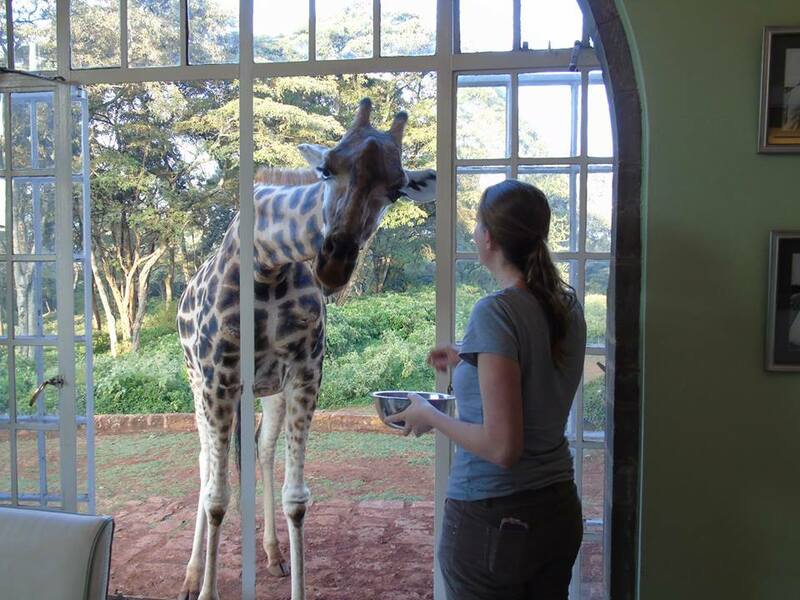 The real gem is the herd of Rothchilds giraffes that spend their day pottering around, joining the guests for breakfast. Giraffe Manor is a luxury hotel wrapped in a conservation blanket. The overriding aim is to preserve and conserve the endangered Rothschild giraffe and to educate visitors about the giraffe's plight - in 2016 it was estimated that there were 1671 wild Rothschild's giraffes left in the wild. 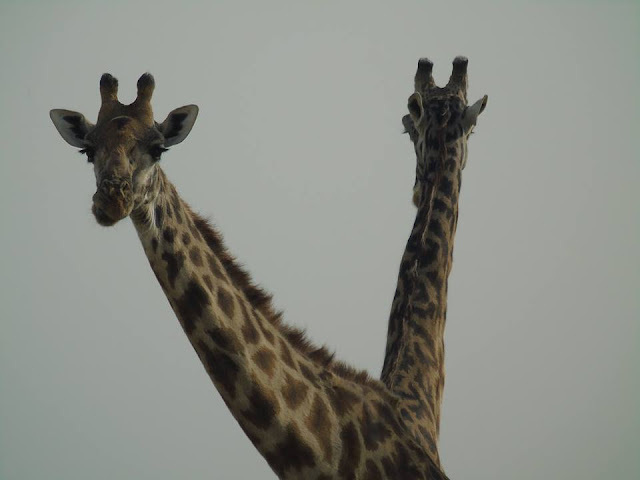 In order to try and conserve the species, Giraffe Manor has a Giraffe Conservation Centre in its grounds with a breeding and education programme. There have been a number of successful births at Giraffe Manor and if you're lucky you will get some close contact with the babies. When I say close contact, I really do mean close contact. 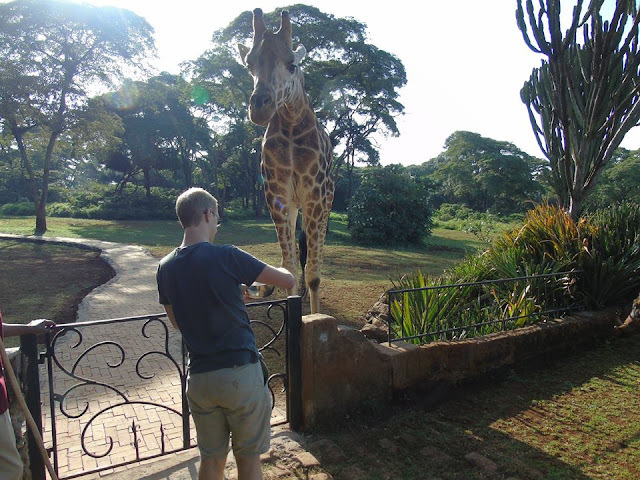 As with all wild animal interactions, it is important to address whether this is an ethical attraction and to ensure that it benefits the giraffe. Usually I would not advocate activities where there is close contact with or feeding wild animals. However, Giraffe Manor is different. Whilst you can get close to the giraffes, they are wild animals and the staff are at pains to stress that you do not approach them- you allow them to approach you. 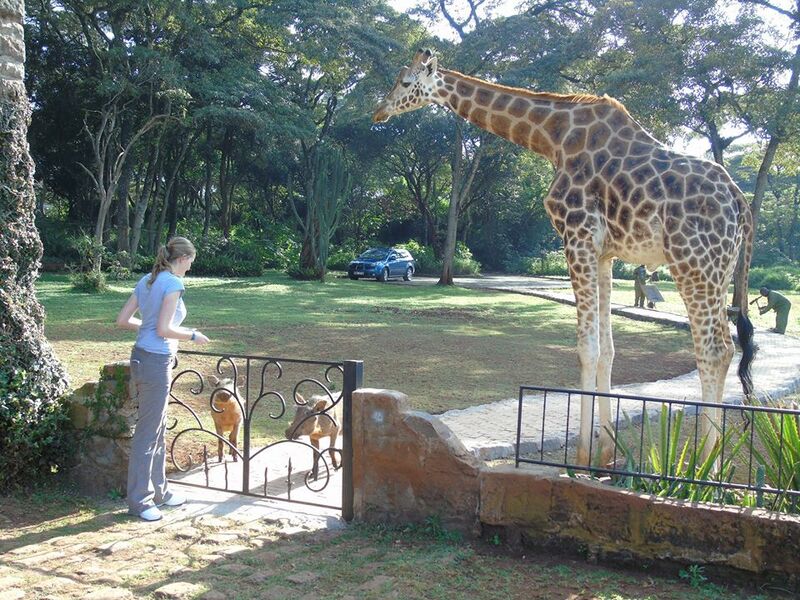 Interaction can not be guaranteed with the giraffes but it is common and utterly enchanting. There are bowls of giraffe suitable food in the Manor that the staff will help you to offer to any giraffe that might be intrigued by you, and more often than not they will stop for a brief snack with you (sometimes, they will also sneeze that snack up your arm!). The staff are fantastic and all very clear that the welfare of the giraffe is of paramount importance. As part of your stay at Giraffe Manor you can expect a visit to the Giraffe Centre (to learn more about the breeding programme and reintroducing breeding couples into the wild) and also to the David Sheldrick Wildlife Trust to see the conservation efforts towards orphaned elephants. As part of your stay at Giraffe Manor you will have access to a driver who will happily take you to the David Sheldrick Wildlife Trust. You can then spend an informative and entertaining few hours watching the little orphaned elephants having a wonderful time in the mud. 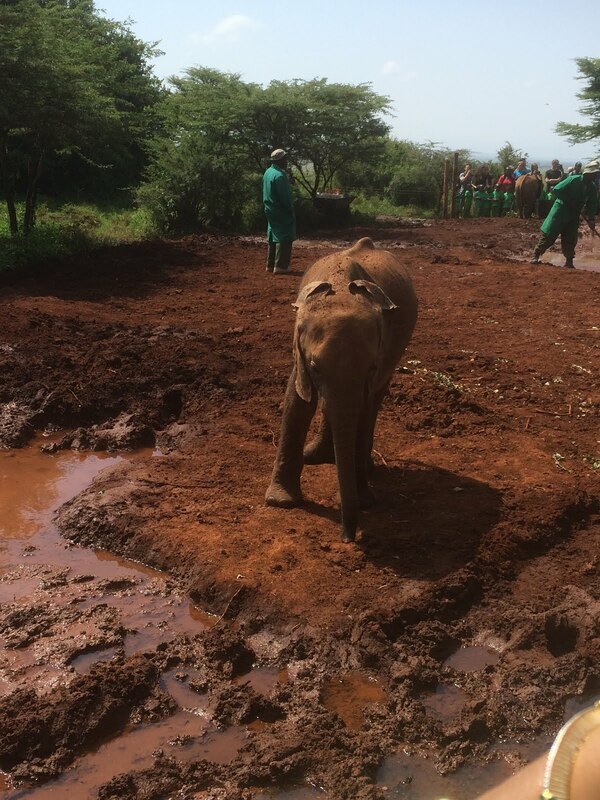 Be aware, there is such a thing as a "splash zone" around a baby elephant, and it is about 2 miles wide! 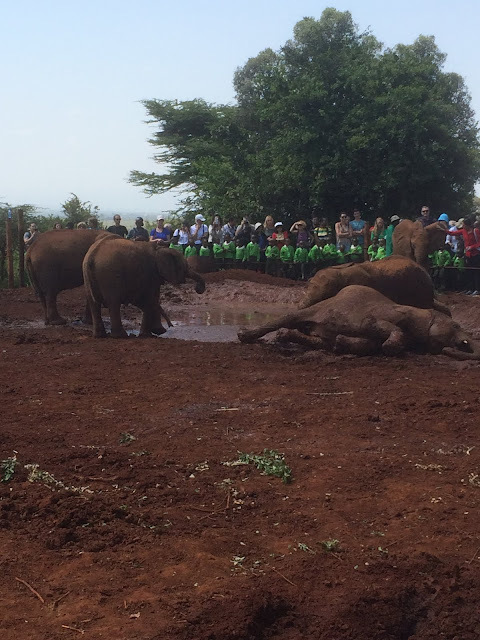 Possibly the most satisfying part of the David Sheldrick Wildlife Trust is watching the baby elephants thunder down the hill, one at a time, and screech to a halt when they see their personal handler holding their milk. These hilarious little souls all bond firmly with their handlers and pull them about, skidding in the mud, trying to play. When a baby elephant decides it wants to play with you there is not much you can do other than go with it! It is an eye opening experience as the keepers explain to you over the loud speaker the hardships these tiny elephants have already faced- the cruel realities of the ivory poaching trade and the detrimental impact humans have on the natural habitat of these magnificent beasts. Back at Giraffe Manor there is a bonus animal who, in my personal view, is often overlooked. Nature's clowns- the warthogs! Ever hopeful for a dropped snack, the warthogs hang around with the giraffes in a scene reminiscent of a slightly misguided "Lion King". 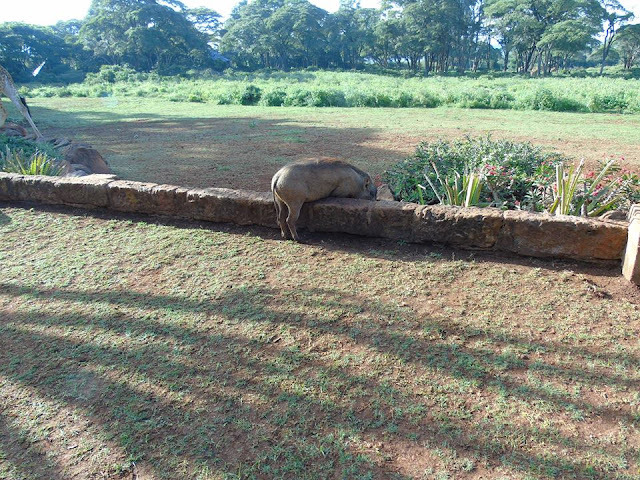 Occasionally an over enthusiastic (and over full) warthog will get wedged on a wall and need to be chased away by the staff. Overall, the warthogs were the most entertaining of the wildlife we encountered just because they have no shame in the lengths they will go to just to snaffle one little illicit snack! What am I eating and drinking at Giraffe Manor? Whilst we're considering snacks for the animals, it feels like a good time to tell you what to expect to eat as a human. All meals and snacks are included in the price of your room, as are the majority of drinks (largely the only exception is imported alcohol and champagne). There is no shortage of delicious food at Giraffe Manor. The day starts with a cooked to order hot breakfast. This was totally wasted on us as the giraffes arrived and breakfast was abandoned to spend some time with Daisy instead! If breakfast is not enough food for you (it certainly will be, but let's imagine for a moment) then lunch will certainly fill any gaps you have left. 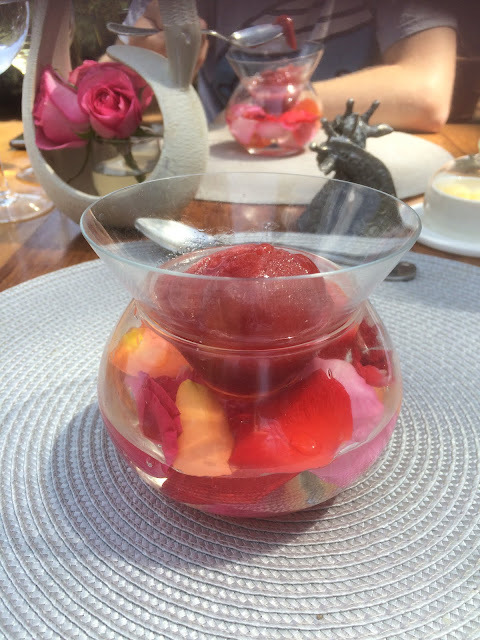 Served as waiter service and with menu designed by the resident Chef, lunch was served on the beautiful sundrenched terrace overlooking the gardens. Each course is expertly matched with a glass of wine to make the whole experience a little more fabulous! 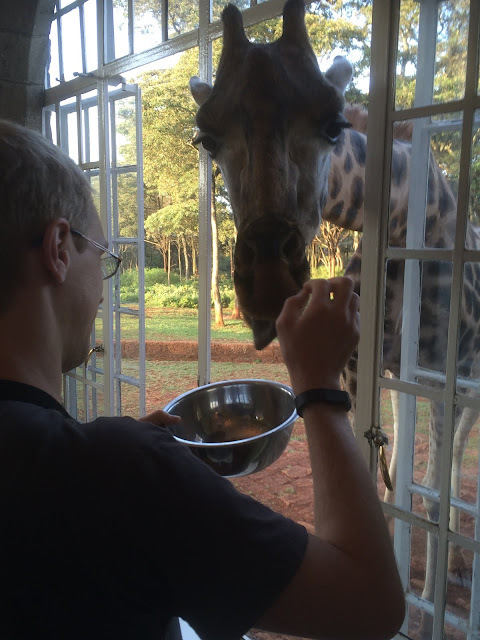 After lunch it is likely that you will be invited to the Giraffe Centre or the David Sheldrick Wildlife Trust as described above, which will give you an appetite for afternoon tea on your return. 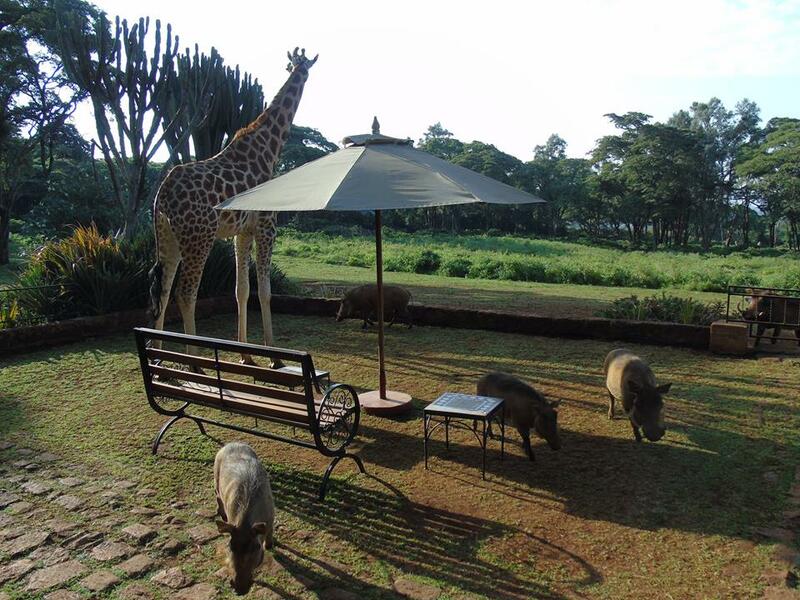 Served on the front terrace, you might expect a little unusual company! Giraffe Manor's resident warthogs trying to snarf afternoon tea! If all of that food is not enough (I know, I know, by this point you've undone your trousers and you're quietly admiring your Food Baby Belly) then a formal 3 course dinner is served in the evening. Guests are encouraged to dine as a group, to give guests an opportunity to mingle and to enjoy the candelit and intimate atmosphere. 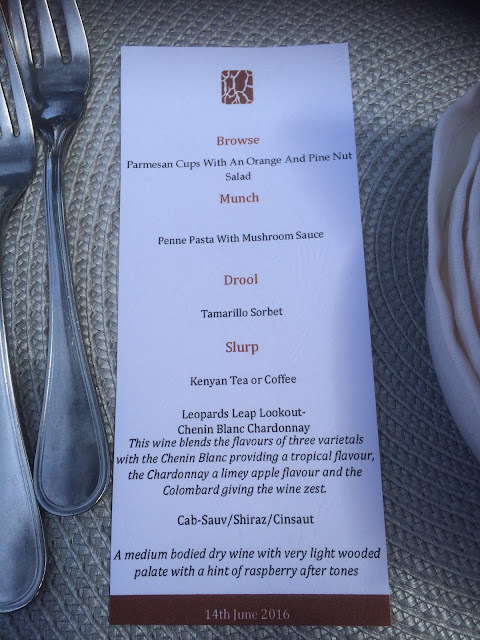 Again, the food is matched with wines for a truly enjoyable dining experience. After dinner, you can take the opportunity to indulge in an after dinner drink in one of the lounges and wait to see if you can spot a giraffe slinking through the night. Once you have slept off all of that food, it's time to start again in the morning with another perfect breakfast! The Rothschild Giraffe is an endangered species and you can contribute to the conservation efforts on holiday! Ethical wildlife interactions are so much more valuable than encouraging abusive forms of animal tourism. Vote with your money and only support those attractions that benefit the wildlife rather than harm it for tourisms sake. The staff are absolutely incredible and nothing is too much effort. From Toni the manager to the porters, gardeners, drivers, waiters - everyone was an absolute delight and seemed genuinely joyful in their work. Warthogs have absolutely no shame, there is no level too low to stoop too for a free meal, and I can really feel that in my soul. It is a dream of mine to visit this place! I didn't know there were elephants and warthogs in the property. That adds tot the charm! I'm dying to visit this hotel. I had heard about it and then I recently watched a tv show about Giraffe Manor. Loved your write up and now I want visit even more! I love that they tell you to let them approach you. The animals need to be allowed to live their lives. I feel like it's truly respectful to them that way. Wow this place looks amazing. Firstly the building is stunning and like something out of 'Midsummer Murders' and then all the creatures turning up to say hello. It looks like a wonderful experience, must be a bit pricey though! This looks wonderful!! 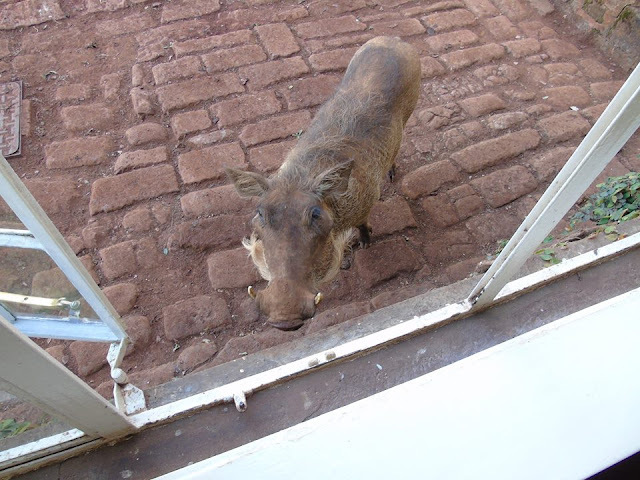 And glad to hear that the animals' wellbeing is of the utmost importance - love that warthog stuck on the wall! omg omg omg omg omg omg omg omg. What an amazing experience, you lucky thing! 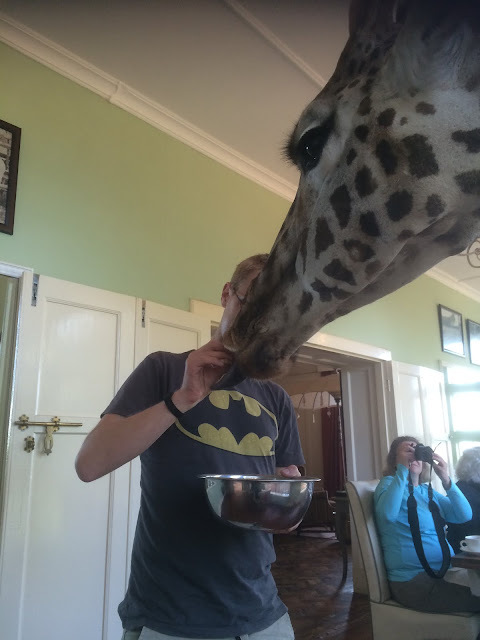 It's really great to hear that conservation is top of the hotel's list as I've often been worried about that with how close the giraffes get to you. Thanks for putting my mind at rest :) And that photo of the warthog wedged on a wall just too much... so funny! The Slovakian capital city of Bratislava is a medieval marvel, surrounded by soviet architecture, nestled between the Danube River and incredible mountain ranges. The fact that it attracts around 4.6million visitors a year seems to suggest that this gem has remained largely hidden. With so much to offer, it seems unfair that Bratislava is not higher up every body's list. If you were considering Bratislava as a weekend retreat, then I can happily recommend a few things to keep you busy! Any visit to Bratislava would not be complete with a meandering walk through the maze of alleys and boulevards of the Old Town. 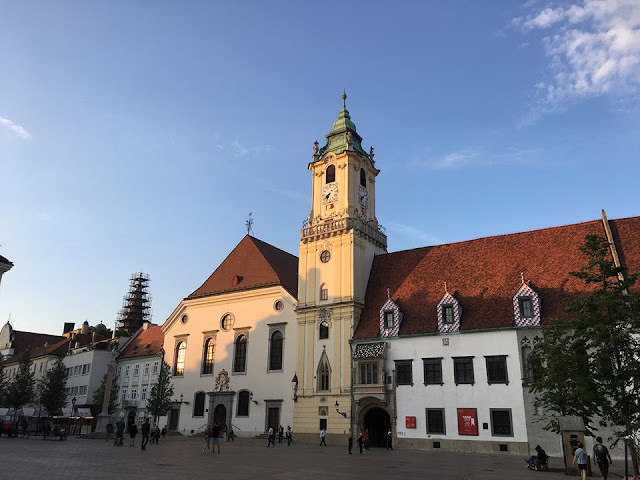 Filled to the brim with Churches and restaurants, overlooked by the imposing Bratislava Castle on the Hill, the preserved Medieval centre of the Old Town is a fantastic place to while away a few hours. 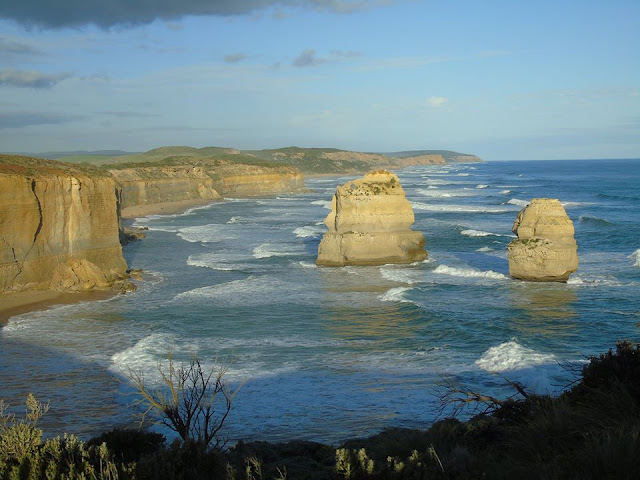 The Great Ocean Road is a bucket list dream. The ideal situation would be to spend a long weekend exploring, but what if you don't have a long weekend? Well, arguably the main attractions can be squeezed into one day with a bit of planning and a lot of caffeine. Safety first, this is a long day out with a lot of driving. Take care of yourself, rest when tired, share the driving. That dealt with, it's time to enjoy the ride! We left the Dandenong Ranges outside of Melbourne very early in the morning. After two hours we arrived in Torquay, where we stood on the cliffs to stretch our legs and admire the view. 30 minutes later we arrived at the start of our itinerary. Kenya is an incredible country- beautifully diverse landscapes, breathtaking wildlife and fantastic people. With so much to cram in to your time in the country it can be hard to know where to start. To take the stress out of planning, here is a suggested 8 day itinerary to make sure the time poor can be the experience rich! You've probably had a long and exhausting flight to reach Kenya, so when you arrive you might be keen to relax and take a nap. 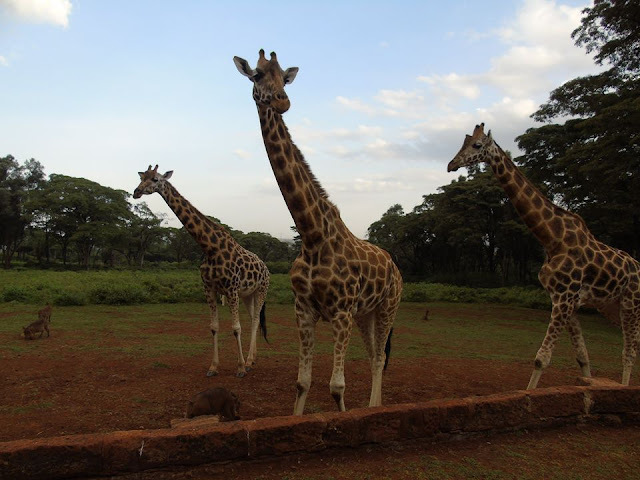 No time I'm afraid, because the first 24 hours of this suggested itinerary take you to Giraffe Manor. Enjoy being fully immersed in the conservation of the endangered Rothschild giraffes that make Giraffe Manor their home, and be ready to be enchanted when you see these long legged beasts galloping around the grounds. I could wax lyrical about Giraffe Manor all day, but to save you the time you can read the full review here.